Hello, guys What’s up!! Today we’ll discuss something about Apple MacOS features which are really interesting, awesome and useful, so let’s start. Previously we’ve shared an amazing list of best Linux OS for gaming in 2017, they’re some really good distribution of Linux based on RPM, Debian and others which your can use for your gaming to enhance your smooth gaming experience, you can pick your favorite OS after reading its Hardware Requirements and hit the download button there, so don’t forget to check them out after reading this post. Did you ever try to use some important features on your MacOS? Have you Ever used that useful features in your productivity work? Well, I bet you most of you don’t know about these awesome features!!! We all know that Apple’s MacOS X is the world’s useful and beautiful operating system and most of the businessman, designers, and bloggers would like to use and work on the MacOS, but the most of the people are still aware of some awesome MacOS features that are not well known yet but still amazing and useful in daily works. 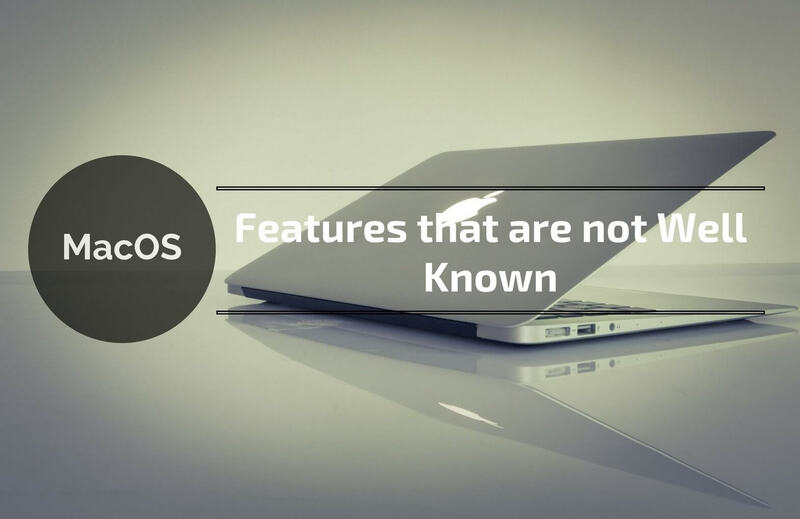 You may be surprised to learn that the Mac OS X has plenty of features that are not well known to the masses. However, you need not belong to that category of people anymore as we have listed some of the hidden Mac OS X guides and features to enhance your user experience. Have you dreamt of typing without doing it manually on the keyboard? Well, you need not dream anymore because it is possible on the Mac OS X where you can type through dictation. In order to use this function, all that is required for you to do is to press the function key twice. Then, you can speak whatever you need to be typed. After that, you need to press the function key in order to command your system to convert the speech to text. Were you aware of the fact that you could actually sign digital documents with your Mac OS X supported MacBook? Well, all that is required for you to do so is to use the feature, Preview. You should then proceed to pen your signature on a paper and place it in front of your webcam. And then, you will be able to use the signature. The Quick Look feature allows users to view a file without opening the application by simply using the spacebar. Basically, you can preview any type of file whether it be a word document, image, or even video clip and all that´s required for you to do is to select the document and press the spacebar. Were you aware of the fact that you could browse discreetly on Safari? If you don’t like other people know what you are browsing, you can simply use a private browsing window to do your research. In order to open a private browsing window, you will need to go to the application, Safari. Then, you need to select File. After that, you should select New Private Window. You can also use the hotkeys, shift-cmd-n, to have access to a New Private Window. Do keep in mind that the search bar of the private window is always gray in color. It is possible for you to summarize long monologs and text on the Mac OS X. How can you do so? Well, first and foremost, you need to select the text you would like to summarize. Then, you should right-click on the selected text. Upon doing so, you will see an option aptly titled, ¨Summarize.¨ It sounds terribly easy, doesn’t it? Well, it is! If you are affluent enough to be in possession of a Mac that boasts of a Retina display, you should make optimum use of it. You can create more screen space on the aforementioned device by using the ¨More Space¨ scaled resolution. All you need to do is to adjust the display scaling. For easy access to the menu that facilitates more screen space, you can use the hotkeys, ⌥ + F1 or F2. So, guys, these are the most important and awesome MacOS X features which you can find any version of MacOS like Yosemite, ElCapitan, and Sierra also. So start using these features and enhance your MacBook or iMac experience using these features and let us know in comments how do you use these features and if liked this post and if you found it is interesting and helpful so don’t forget to share this post with your friends and ask them about using these features. We’ll come in another post, till now use and enjoy this features, don’t forget to subscribe us for daily updates from our blog to your inbox.